Here's another gem from the amazing Mellotron-loaden Skandinavian progrock scene, this time a Swedish band including Mattias Jarlhed (percussion), Jonas Hallberg (guitar and backing vocals), Daniel Fäldt (lead - and backing vocals, sitar) and Stefan Renström (bass, keyboards, voices). Releases: album "Ceinwed" from '95 and "Paradise Square" from '02. Main influence: mid-GENESIS. The second album is superior to their debut, in my opinion "Paradise Square" is one of the best releases from 2002! Most of the 7 songs are long, alternating and elaborate pieces with lots of surprising ideas: classical guitar and piano, a jazzy intermezzo, sensitive Spanish guitar or sitar and tablas. The 24-carat symphonic sound is very inspired by mid-GENESIS but has also echoes from ANGLAGARD (sumptuous Mellotron waves), SPOCK'S BEARD (shifting moods and fiery electric guitar), MARILLION (keyboards) and MANFRED MANN'S EARTH BAND (Minimoog flights with pitchbend). The vocals are at some momens a bit theatrical but in general strong and convincing. 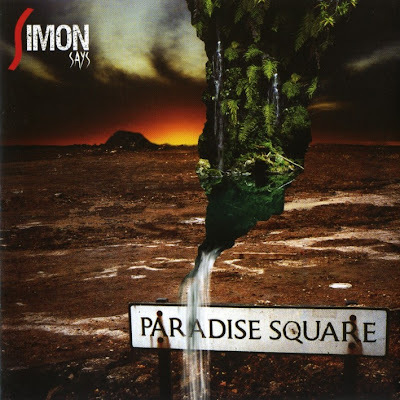 Funny self-mockery: SIMON SAYS has integrated some musical moments from GENESIS albums ("The Lamb..." and "Foxtrot") but the way they have done this, showcases the mature compositional skills. Recommended. All music & lyrics by S. Renstrom, except 5: music by D. Faldt & S. Renstrom.